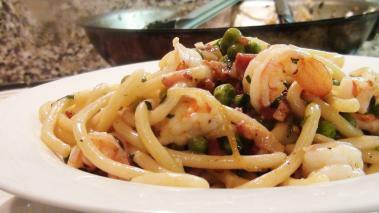 Spaghetti, Shrimp, Pancetta…how you can go wrong? Pasta dishes that are simple, and seem simply “thrown together” are often my favorites, and this recipe for Spaghetti, Shrimp and Pancetta is exactly that. Both spaghetti and shrimp, take little more than 10 minutes to cook, and not much longer for pancetta, or bacon if that’s what you have. That means that within about 30 minutes, you can make this simple dish that has succulent, tender shrimp, flavored with salty and savory bacon, all supported and carried together by the perfectly cooked al dente spaghetti. It’s easy to modify this dish with additional herbs and veggies, and I encourage you to do so. Hope you enjoy it as much as I do! The shrimp, can’t be overcooked, or they’ll get rubbery. So I cook them quickly at the end. If you’re not comfortable with how long things will take, cook them separately, first, and then hold them off the heat to add back and then very end. The pancetta needs to be cooked well, to render out the fat. Again, I cook it separately, until it’s nice and crispy. That will concentrate the flavor and keep it from becoming soggy in the sauce. Serve it up and a pasta bowl and enjoy! Wine recommendation: I’d definitely call for a nice crispy white wine with this recipe, and since we’re dealing with both spaghetti and pancetta, let’s stick with Italy. I think you have plenty of options, the most readily available would be a simple Pinot Grigio, but my favorite would be a Timorasso from the Piedmont region. The flavor is fairly bold and will hold up to the pancetta flavors, without overpowering the dish. Enjoy!